Home / Blog / Smoking / What is an Ash Catcher? Have you ever noticed how dirty your water pipe gets after only a few weeks of smoking? This not only makes your beautiful glass bong ugly it also makes it smell very bad. If you’ve ever spilled old bong water you know exactly what smell I’m talking about. On top of that, trying to smoke out of a dirty pipe can cause drag, percolators get clogged with ash. This will definitely give you an unpleasant smoking experience. If you clean your water pipe regularly it will certainly help with these negative smoking experiences. However, who has time to clean their bong all the time? Adding an ash catcher to your water pipe makes cleaning and maintaining your bong that much easier. It also comes with many added benefits that a lot of smokers are unaware of. What are ash catchers and how do you use them? Ash catchers come in a wide variety of different sizes and styles, but they usually look like miniature water pipes. They attach to your water pipe to trap and contain most of the ash and debris. This ash and debris would normally end up in your pipe. All this ash would usually end up in the water making it dirty and unpleasant to smoke out of. Most ash catchers contain a percolator for added diffusion to make smoking from your bong easier to inhale and much better tasting. It’s like adding an extra filter to your water pipe. One of the biggest benefits of using an ash catcher is you will spend a lot less time cleaning your water pipe. You will get more time smoking out of it. If you have a smaller piece or one that is very easy to clean you won’t need an ash catcher. But if you have a larger piece with lots of percolators an ash catcher can be a real bong-saving accessory to have. An optional extra for your water pipe upgrades and thus sold separately from the water pipe itself. To ensure you get the right ash catcher for your water pipe you will need to know the joint size of your pipe so that you can get the correct joint size ash catcher. Most ash catchers are male joints and meant to be combined with female jointed water pipes. If you have a male jointed water pipe, you can always get a glass adapter to make it fit. Ash catchers range in price depending on the complexity of their design and size. Your ash catcher will attach to your water pipe the same way you take your bowl in and out. Your bowl will now go into the ash catcher instead of directly into the water pipe. When you take a hit the burned ash will get trapped in the ash catcher instead of passing into the water pipes main chamber. Be sure not to add too much water to your ash catcher. This will result in the dirty water will flow into your water pipe. You may want to consider purchasing a K – Clip to secure your ash catcher to your water pipe. A K-Clip is a small plastic clip that locks the ash catcher into your water pipe so it does not come out when removing the bowl. How to choose the right ash catcher for you! Now that you have decided you want to add an ash catcher to your water pipe. It’s important to make sure you get the right one! As mentioned earlier the first thing you will want to look at is the joint size of your water pipe and the joint size of the ash catcher you want to get. You need to make sure that the joints will fit together properly so the ash catcher and your water pipe function correctly. The next thing you need to consider is the angle of the joint on your ash catcher. Most ash catchers come in either 45 or 90-degree angles. The 45 or 90 degrees is referring to the angle at which your ash catcher will attach to your water pipe. Depending on the angle of your water pipes stem you will have to decide which works best for you. You will also need to make sure the ash catcher will not hit any part of your water pipe. This is usually easy to do just by imaging what the ash catcher would look like if attached to your bong. You want to make sure you will be comfortable smoking with the ash catcher attached to your water pipe and make sure the bowl is not at an angle that could cause you to either burn yourself or cause herb to fall out of your bowl. The last thing you need to consider is if your water pipe is strong and sturdy enough to hold the ash catcher you want so that it will not tip over when you are not using it. Last but not least you need to decide what kind of percolator you want it to have. It could have a honeycomb tree, inline, showerhead perc. 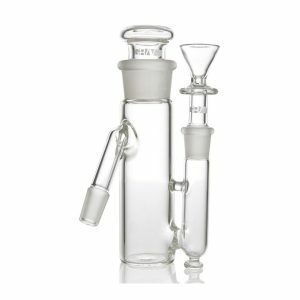 If you already have a water pipe with loads of percs you will probably want just a basic ash catcher to collect ash that will not cause any extra drag to your piece. If you have a basic water pipe and are looking for more diffusion than you will want an ash catcher with more percs or more chambers. Most ash catchers are only one chamber but there are some that have two chambers. Each of these can contain a perc for a lot more added diffusion. If you have the money to spend, this is a must-have accessory for any water pipe. It will definitely make your smoking experience more enjoyable and will definitely make cleaning your bong much easier. 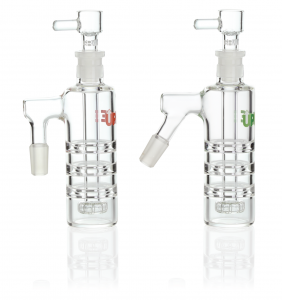 Make sure you browse our selection of ash catchers to find the perfect one for you. Cheaper is not always better especially when it comes to glass. If you see an ash catcher for a hundred bucks chances are it’s very thin glass and will likely break sooner than later. ← Volcano Vaporizer – Is It Worth the Bucks?